Europe’s global role: The consolidation and enlargement of the EU has changed Europe’s global role in fundamental ways. Nevertheless, the hope that the foreign policies of the member states would converge within the framework of the Common Foreign and Security Policy have been dampened by disagreement about the war against Iraq. Still, in the future, the EU will increasingly take on tasks that used to be the preserve of NATO or the US. The foreign policy of a powerful EU will differ from US policy in that it will be a continuation of the experiences Europe has made in the area of security through supranational co-operation and institutions. To the degree that the European Union is a new entity on the world stage its foreign policy, too, will be entirely new in character. The inclusion of a gender perspective in the Colombia's peace agreement: past, present, and future. The precarious balance between the need for security and the right to privacy will continue to characterize “risk societies” of the 21st century. This compendium by Thorsten Wetzling and Kilian Vieth provides robust oversight practices and good laws that can serve as bulwarks against the erosion of fundamental rights in Europe and America. A Merkel-Trump clash at NATO seems inevitable - what will Germany do? The effects of the current global power shift are most visible in the Asia-Pacific region: China’s rise and the unclear future of the U.S. alliance system in the region raise a number of foreign and security policy issues that have both regional and global dimensions. During the 19th Foreign Policy Conference of the Heinrich Böll Foundation international experts discussed on "The Asia-Pacific Conflict Zone. Crises, power shifts and their repercussions for Europe and Germany"
In 2018, political relations on the Korean peninsula are in flux to an unprecedented degree. Taking note of the unclear situation, this article deliberately engages in speculation and develops three scenarios for the region. The EU or its member states have ideal requisites for greater involvement in a necessary peace process between North and South Korea. After several years of fast acceleration in North Korea's missile and nuclear program, this year the Democratic People's Republic of Korea put on the brakes, pursuing instead a “charm offensive”. The reader for the 19th Annual Foreign Policy Conference about the current geopolitical power shifts in the Asia-Pacific region and their effects on Europe and Germany. The future international security landscape will be critically impacted by the military use of artificial intelligence (AI) and robotics. Meaningful human control over weapon systems and the use of force must be retained. Armed unmanned aerial vehicles (UAVs) — more commonly referred to as drones — have become a central pillar of the United States’ counterterrorism strategy. A number of European actors have expressed growing concern regarding the lack of transparency, accountability, and clarity surrounding the U.S. drone program. Read the joint conference report by hbs and the Stimson Center on this pressing issue here. 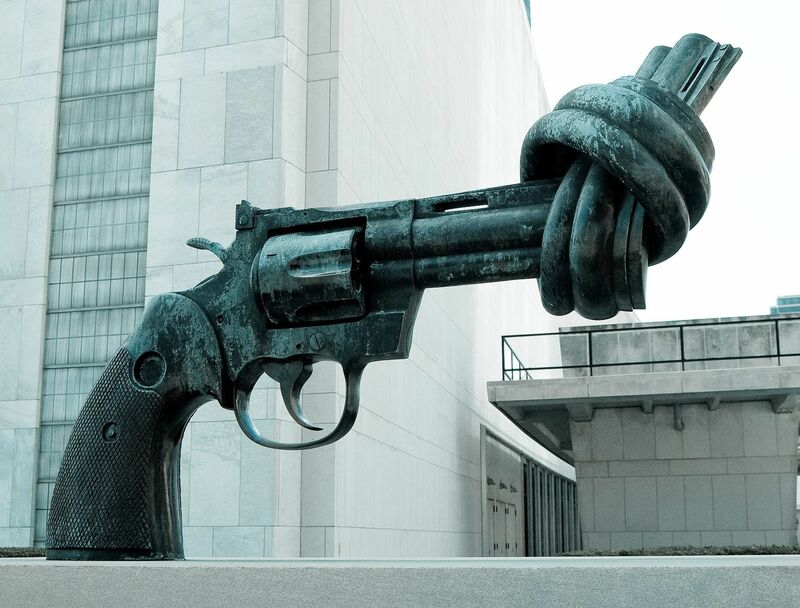 The instruments of bi- and multilateral nuclear disarmament and arms control are in a state of despair. Under the label of N.EX.T. (Nuclear Expert Talks), fifteen scholars from Europe, Russia, and the United States gathered in Berlin in November 2016 to discuss the current state of disarmament and arms control. It is vital to intensify the work on an architecture for peace across Europe. The purpose of this report is to provoke further discussions on how this can be done without losing sight of the causes of the current crisis. All Publications on "Foreign Affairs & Security"
Die Eskalation des bewaffneten Konflikts in Syrien haben schmerzlich an die Notwendigkeit erinnert, die Bemühungen um Rüstungskontrolle zu intensivieren. Currently the debate on nuclear weapons in the European Union is not making any progress, this could be due to the failure of the Non-Proliferation Treaty in 2015. Nevertheless, a nuclear-weapon-free zone in Europe should still be envisaged. How can trust be built when 16.000 weapons of mass-destructions are faced to each other? Anda Serban is the Coordinator of ICAN Romania and reflects on her experiences with lobbying. Nuclear disarmament has long been a distant issue in the life of Philippinean peace advocator Loreta Castro. Over the last two years of involvement she began to see it as an urgent imperative. A feminist analysis can help us understand how nuclear weapons are a patriarchal tool, and how it benefits the patriarchy to advocate for their continued existence in the arsenals of a few and selected governments. All Articles on "Foreign Affairs & Security"